Los Angeles County is a region of thousands of square miles in Southern California roughly the same size as Rhode Island. There are 88 cities (municipalities) in the county; the largest, the city of Los Angeles, spreads its tentacles throughout the county. Angelenos divide the county into several regions. The Downtown area, Hollywood, and Silverlake; usually what people mean when they refer to Los Angeles. The north end of the county, high desert and more rural in feel. As the name denotes, this area is just east of downtown and is the Hispanic center of Los Angeles. The southern border of the county with Orange County, heavily Hispanic, and Industrial. 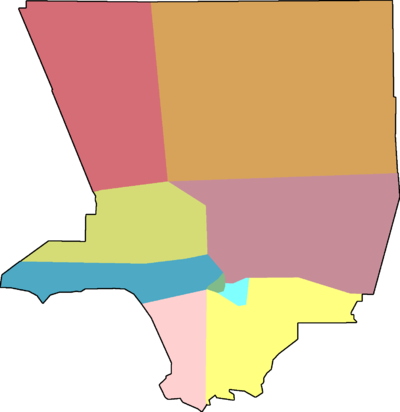 The northern suburban portion of Los Angeles, lying in a valley northwest of downtown, containing various districts. East of downtown Los Angeles including the foothill communities and the San Gabriel Valley, the Asian center of LA. Suburban, relatively new area to the north of Los Angeles proper. The wealthy beach and peninsula cities of the county, also home to Los Angeles International Airport (LAX). The affluent area of Los Angeles where the many of the famous wealthy neighborhoods are. Beverly Hills - Home to many of the entertainment industry's rich and famous, there is some amazing high-end shopping. Hollywood - Actually part of the city of Los Angeles, it is one of the world's most famous destinations. Long Beach - Located in the southern part of the county, and home to the Queen Mary, the Long Beach airport, and other tourist stops. Los Angeles - Known as the City of Angels, it offers food and entertainment options that are among the best in the world. Pasadena - Sitting at the foot of the San Gabriel Mountains, it is the home of the Rose Parade and the Rose Bowl on New Year's day. Its Old Pasadena district is one of the more vibrant destinations in the county. Santa Monica - A beach town famous for its pier and popular with visitors. Angeles National Forest  - +1 626 574-5200 Fax: +1 626 574-5233. Spanning most of the county from east to west, Angeles National Forest offers camping, fishing, hiking and skiing. Driving through the forest is free but if you plan on parking, an Adventure Pass is required except for the last Saturday of each month. Daily Pass: $5, Annual Pass: $30. Santa Monica Mountains National Recreation Area  - 24-hour recorded message: +1 805 370-2300, Visitor Information: +1 805 370-2301 Fax: +1 805 370-1850. The Santa Monica Mountains NRA is made up of several smaller units ranging from an old movie studio lot to wilderness areas and is administered by the National Park Service. Los Angeles is in the Pacific Time Zone and has Daylight Savings Time. English, and Spanish are the most common languages spoken in Los Angeles County. Because of the ethnic diversity of Los Angeles, there are many neighborhoods where other languages are dominant, mostly those from Asia. Los Angeles International Airport (IATA: LAX), 1 World Way, +1 310 646-5252, . LAX is one of the major ports of entry for international flights to the United States as well as a major destination for domestic flights so it can be quite busy, especially around holidays. Most of the major airlines as well as some smaller regional airlines fly into LAX. All of the major rental car agencies have a location near the airport with hundreds of cars available for rent. Bob Hope Airport (IATA: BUR), 2627 Hollywood Way, Burbank, +1 818 840-8840, . Alaska, America West, American, Delta Airlines, JetBlue, Southwest and United Airlines fly into this airport located north-east of Downtown. Long Beach Airport (IATA: LGB), 4100 Donald Douglas Dr., Long Beach, +1 562 570-2678, Fax: +1 562 570-2603 e-mail:[email protected], . Alaska Airlines, American Airlines, America West Airlines, US Airways, and JetBlue Airways fly into this airport located in southern Los Angeles County. Ontario International Airport (IATA: ONT), 1940 East Moore Way, Ontario, +1 909 937-2700, . Located 37 mi (59 km) and a 40 minute drive east of Downtown Los Angeles. John Wayne Airport (IATA: SNA), 18601 Airport Way, Santa Ana, +1 949 252-5200, . Located 40 mi (64 km) and a 45 min drive south-east of Downtown Los Angeles. The Pacific Surfliner runs from San Diego to San Louis Obispo. It has three stops in Los Angeles County: Union Station in Downtown Los Angeles, Glendale and Burbank. San Joaquin runs from Bakersfield to Oakland and Sacramento with Amtrak Thruway bus connections to Union Station in Downtown Los Angeles. Metrolink  - Toll free: +1 800 371-5465. Metrolink trains connect surrounding counties with Los Angeles County with most lines having a terminus at Union Station in Downtown Los Angeles. Each line has several stops in Los Angeles County in addition to stops in their originating counties. Long Beach has a Carnival Cruise Lines  terminal. 231 Windsor Way, Long Beach, +1 562 901-3232. Los Angeles County has an extensive freeway system that criss-crosses the county. The freeway system is a mixed blessing, allowing access to most areas at the same time but very confusing for the uninitiated, especially during rush hour. Residents of Los Angeles County spend an estimated 4 days of each year stuck in traffic. However, since there is no real effective alternative for getting around, driving, and dealing with traffic, for the vast majority of trips outside the downtown core, traffic is an inescapable part of the Los Angeles lifestyle, and something visitors will not be able to avoid. When traveling on a Los Angeles freeway it's important to remember slower traffic keeps the right. Many Angelenos do well over 20 mph of the posted speed limit and cutting them off or remaining in the fast lane at a slow pace, will cause frustration with native drivers. Despite the infamy of Los Angeles' traffic situation, people from other major cities may not be surprised. The real issues are the sheer length of the rush hour period, and the volume of traffic therein. The assertions of driving difficulty and danger will most likely seem unfounded to residents of large cities, especially comparatively frantic northeastern locations such as New York, Philadelphia, Boston, and Washington, who often see Los Angeles traffic as relatively easy-going. Indeed, the New Jersey Turnpike, the Beltway, and the Schuylkill Expressway offer easily comparable volume and far less forgiving conditions. It is actually very easy to drive around Los Angeles for about six hours every day - from around 11 PM to 5 AM. Driving times in these morning hours can easily be less than a third of what they are during peak hours. Don't think for a second that CalTrans hasn't figured this out too. A lot of construction is scheduled during these off peak times; be ready to plan alternative routes. Anyone planning on visiting by car may wish to seriously consider scheduling the trip so as to arrive or depart in the early morning - this can prevent a great deal of frustration. This is also an excellent time of day to find your way around, memorize your traffic routes, and explore. While nearly every big city in the world has to deal with traffic congestion, what makes L.A. unique is that Los Angeles has not only one of the largest high-speed road networks in the world, but also the highest per-capita car population in the world. How did this come to happen? A short lesson in history: along with the great boost of technological advancements of the 20th century came the automobile. Due to its economic prosperity and automobile-centric development, the United States has become the country with the most registered vehicles, estimated at some 232 million. California, being the country’s most populous state with the biggest passion for cars, planned its cities such as Los Angeles around the automobile in favor of other modes to an extent greater than perhaps than any other city and now holds the greatest concentration of them all with more than 26 million. This makes the Los Angeles metropolitan area, with roughly 1.8 cars per household, the most car-populated urban sprawl in the world. The Los Angeles freeway system handles over twelve million cars on a daily basis. While L.A. holds the number one spot as America’s most congested and polluted roadways, surprisingly enough, it does not hold the title of most chaotic car city due to its enormous freeway infrastructure that allows the residents of the Los Angeles area to carry on their daily migration of over 300 million miles. GPS systems are easily your best friend when navigating LA. If you have access to a smartphone all you have to do is plug in your destination, roll down the windows, and enjoy the legendary Californian weather. If you don't have access to a GPS or smartphone, you should purchase a Thomas Guide. If you don't want to purchase a full Thomas Guide (about $20-$30 at bookstores), you can purchase Rand McNally maps which incorporate the Thomas Guide at most gas stations, supermarkets, and convenience stores (Costco and Walmart usually have the cheapest prices). The maps cover a given geographical area and cost about $4-$6. Use of an online mapping tool, such as Mapquest, is also recommended. As a general rule, time estimates given by Mapquest should be at least doubled during rush hours. In his parody traffic reports, Tonight Show host Johnny Carson used to refer to the "Slauson Cutoff". While driving around LA you often have the option of taking freeways or surface streets. Some locals rely on surface streets to avoid rush hour traffic on the freeways. For example, many people driving to the San Fernando Valley during rush hour will opt to take Sepulveda Blvd, which runs parallel to the 405 Freeway, since the 405 often takes longer at this time of day. In nearby Culver City, La Cienega is used as a cutoff from I-10 to LAX. The effectiveness of such strategies is debatable, and it may be difficult for inexperienced drivers to accurately guess which way will be faster. Outside of rush hour, the freeways will almost always be faster for longer trips around LA. One particularly annoying aspect of freeways in Los Angeles County is finding an onramp. The onramps are marked with signs marked "Freeway Entrance" but these can be frustratingly difficult to find. Each freeway is identified by a number, and usually one or two names. In addition, there are three types of freeways: interstate, federal, and state. Federal and state routes can be either freeways or streets or alternate between both but all interstate routes are freeways. When giving directions, most locals refer to a freeway by its number, "the 405 freeway" or "the 101 freeway", or just "the 101". In some parts of the country, the indefinite article is dropped, whereas it is kept in most of the west coast: "Take the 405 to the 101" rather than just "Take 405 to 101." Although both are acceptable, you may encounter momentary confusion when using the latter with locals. Local radio station traffic reports, on the other hand, often refer to freeways by name, leading to confusion. Names usually identify where the freeway goes in a general way; the Ventura freeway is either going toward or away from Ventura, and names change when there is a better-known and closer target. This can be confusing to out-of-towners. For example, the 110 runs from Pasadena in the north to the LA harbor in the south. The portion north of the 10 (Santa Monica Freeway, which runs through downtown Los Angeles) is the Pasadena Freeway and the portion that runs south of the 110 the Harbor Freeway. One thing to be aware of is that a number can shift freeway names; the Hollywood Freeway is the 101 south of the Ventura Freeway, and the 170 north of the Ventura. The Ventura takes over the number from North Hollywood to the west. The eastern portion of the Ventura Freeway is the 134. 1 - Pacific Coast Highway or more commonly PCH: Not really a freeway per se. But convenient for the beach towns as it sticks to the coast most of the way through the county, and one of the scenic ways to tour the Los Angeles coast. Usually slower than the 405, it is riddled with traffic signals. 2 - Glendale Freeway: This freeway connects the 210 in La Crescenta/La Cañada to the 134 and 5 freeways before petering out in Silver Lake/Echo Park. Convenient for getting to the Angeles National Forest and Dodger Stadium. 5 - Golden State Freeway/Santa Ana Freeway: The main north/south freeway through central LA. It passes through downtown LA and heads north through the east end of the San Fernando Valley. Continuing north it is the fastest route to San Francisco. Heading south it will take you to Anaheim, through Orange County, to San Diego and the Mexican border. Although this is one of the busiest and most direct freeways in the region, it is also one of the oldest and is often only two lanes in either direction. This freeway originates at the US border in San Diego and goes all the way to the Canadian border in Washington. 10 - Santa Monica Freeway/San Bernadino Freeway: The main east/west freeway. It passes by downtown LA and is the main route between LA and Santa Monica. Going east, it is, along with the 60, the main escape from LA to Riverside County, Palm Springs, and eventually Phoenix and the rest of the country. As a sign near the beginning notes, this is also the "Christopher Columbus Transcontinental Highway" and runs all the way through Phoenix, Houston and New Orleans to Jacksonville, Florida. 14 - Antelope Valley Freeway: This is a freeway starting from the 5 in the south and moves its way to Palmdale and Lancaster (in Northern Los Angeles County). 57 - Orange Freeway: Most of this freeway is in Orange County. But it does connect the 210 in La Verne to the 71, 10 and 60 freeways before heading out of the county to the South (straight on to Anaheim and Disneyland). Convenient if you are in the East of the county for Raging Waters, Disneyland or Cal Poly Pomona. 60 - Pomona Freeway: Runs parallel to the 10 from downtown to beyond Riverside, after which it merges again with the 10. 71 - Chino Valley Freeway: Starts at the 10/57/71 interchange in Pomona in the west and ends at the 91 in Corona. Convenient for getting from Los Angeles County out to Corona and even San Diego (using the 15). 91 - Artesia Freeway: An east/west freeway that connects the 110, 5, 605 and 57 freeways. Be careful about it being a 'beach freeway'. It ends long before it ever gets to a beach, much smarter to take other freeway routes to the beaches. When you reach the end of the elevated freeway, the road becomes a highway until it hits PCH (1). Although you may use it to get to either Manhattan or Hermosa beaches, you will wait at many traffic signals. 101 - Hollywood Freeway/Ventura Freeway: Runs northwest from downtown LA, past Hollywood, and into the San Fernando Valley, where it turns abruptly west and becomes the Ventura Freeway. It then continues to the Central Coast through Santa Barbra and San Luis Obispo and then onwards to the San Francisco Bay Area, Oregon, and ends in Olympia, Washington. The 170 continues northwest as the Hollywood Freeway. Do not be confused by the fact that sometimes the signs indicate 101 South or East and 101 North or West depending on the stretch of freeway. There is no interchange or visible border when these switch. 105 - Glenn Anderson Freeway: An east/west route, a few miles south of the 10. Also known as the Century Freeway. Important because it takes you straight to the LA airport. On the east end, terminates at the 605. 110 - Pasadena Freeway/Harbor Freeway: Runs from Pasadena in the north to the LA harbor area in the south. Unusual in that the southern part of the 110 is an Interstate, while the northern part is a state highway. Probably this is because the northern part, the Pasadena Freeway, would never pass code as an Interstate. Ironically, this portion, also known as the "Arroyo Parkway" was the nation's first limited access "freeway". Designed in the 1930s, when it was assumed cars would be travelling at most 35 miles per hour (60 km/h), the Pasadena Freeway is noted for its extremely short offramps, while its onramps give you just a few car lengths to accelerate from a complete stop before merging with oncoming traffic. 134 - Ventura Freeway: Connects the 210 in Pasadena to the 101 in Burbank. Cuts right through Glendale and Eagle Rock along the way. Convenient for getting to Griffith Park, Disney studios and most of Glendale. 210 - Foothill Freeway: a 'bypass' interstate , running from the valley, intersecting the 5 and the major north/south freeways. The Foothill Freeway parallels the 10 and 60 out of eastern LA county and was recently extended from San Dimas past the I-15 to Rialto. 405 - San Diego Freeway: The main north/south freeway for West LA. It is often the road you take to the Los Angeles airport. The 405 runs north through the San Fernando Valley. It runs south from the airport towards Long Beach, and turns east until merging with the 5 in Orange County. The 405 is the most congested freeway in the world, and should be avoided during rush hour. 605 - San Gabriel River Freeway: A north/south alternative in east LA county, running from near Long Beach north up to the 210, intersecting the 5 and the major east/wast freeways. 710 - Long Beach Freeway: A north/south artery from East LA to Long Beach. This freeway is almost always full of trucks heading in and out of the harbor, so be careful near them..
You can get traffic reports 24 hours a day from several radio stations. Radio stations don't play traffic reports during sports events or special news events. Traffic reports will often substitute the verbal name for a freeway "Westbound Santa Monica Freeway" for the number; be aware that for example, the congestion may be nowhere near Santa Monica. KNX 1070 AM "News Radio" - Los Angeles' 24-hour news station - has traffic reports "on the 5's" when they aren't running the simucast of 60 Minutes (7 pm on Sunday) or 60 Minutes II, or "Weekly Roundup". KFI 640 AM "More Stimulating Talk Radio" and KABC 790 AM run traffic reports four times an hour, usually during commercial breaks of their talk shows. The radio station web sites have links to graphics showing traffic speeds and the accident logs of the highway patrol. Foothill Transit  - +1 800 743-3463 Servicing the San Gabriel Valley with some lines extending into Downtown Los Angeles. Several Los Angeles County cities also have their own bus lines. Taxis are a very viable way to get around in Los Angeles. There are nine taxi companies in Los Angeles that have over 2300 taxis combined. The nine registered franchises are United Independent Taxi, Independent Taxi, United Taxi of San Fernando Valley, Los Angeles Yellow Cab, Checker Cab, United Checker Cab, Bell Cab, City Cab, and Beverly Hills Cab Company. Now there are emerging taxi apps, like RideYellow, that offer a more convenient way to book a taxi in Los Angeles. Los Angeles area gardens with native plants. Theodore Payne Native Plant Garden Tour  - +1 818 768-1802, organized by the Theodore Payne Foundation for Wild Flowers and Native Plants . The annual garden tour, which began in 2004, showcases mostly private gardens throughout the Los Angeles basin that feature 50% or more native plants. Unlike most tours, garden owners (many of whom design the gardens themselves) and knowledgeable docents are available to identify plants and discuss techniques of gardening with California native plants. The tour usually takes place in April over a weekend, with half the gardens open to attendees on Saturday and the other half on Sunday. In 2006, more than 1,700 people visited more than 30 gardens; in 2008, more than 1,000 people visited 38 private gardens; in 2009, more than 46 gardens are featured. Garden locations ranged from Santa Monica to Monrovia, from Woodland Hills to Tujunga. Fred62, a great retro diner, is on Vermont Avenue just north of Sunset Boulevard. Musso & Frank Grill is Hollywood's oldest restaurant that serves great food and a great atmosphere located on Hollywood Boulevard, a few blocks east from Mann's chinese (Theater, not Buffet). From the beginning, Musso & Frank Grill has been a favorite among Hollywood's A-list. Pink's Hot Dogs is on Fairfax about two miles off Sunset. Tommy's, scattered around the city, is a popular place to get a chili cheeseburger and chili cheese fries. Many are open late or 24 hours. Beware of imitators. Bob's Big Boy, leave the relish off this tasty morsel and add on some Thousand Island dressing, you'll thank me later. Bob's Big Boy is located in the sunny vale of Burbank, just a couple of blocks from Universal City Walk. Mercialgio is a great Italian place right outside the gate of Universal City Walk. It is known as one of the best Italian joints in town. House of Blues, where else but on Sunset Strip, has great awesomely-bad food, great prices, and is just an overall rocking place. The Roxy is up the street from the House of Blues, not too shabby, and used to be the hang out spot back in the day. The Griddle Cafe is a little place, but get up early and bring your appetite because they have some of the best pancakes you will ever experience. Also, their french press coffee is known to be some of the best in town. Roscoe's House of Chicken & Waffles is located on Grove, right off Sunset near the 101. If you are from out of town you must have some chicken and waffles. Taco trucks can be found along streets at night, are open late, and provide inexpensive authentic food. In-n-Out Burger, located all over Los Angeles, is the place to go if you are craving a delicious hamburger snack. Cahuenga Corridor, North of Hollywood but South of the 101, quite a few fun places to inbibe quantities of alcoholic beverages. Check out "The Beauty Bar" $10 for a martini and a manicure, but get there early the line tends to gather after 9 p.m.
Lucky Strikes Bowling alley, this place is just awesomely awesome, its located off Hollywood and Vine, behind the borders.There is bowling and beer. Also located Downtown across from the Staples Center. Bar 107, this is downtown, but quite a fun happenin joint, at 107 4th Street, towards East LA with great kitsch. Sunset Strip, mainly the location of live music venues, it also has drinking destinations such as The Rainbow Bar, SkyBar, Chateau Marmont, Libertine, and Saddle Ranch Chop House (one of the few places in LA with a mechanical bull). For all emergencies in Los Angeles County, dial 911. Even though the majority of places are safe, there are some areas in Los Angeles County that are considered to be less safe than others. Parts like South Los Angeles (South Central: Compton, Inglewood, etc. ), Harbor Gateway, Wilmington, and other cities are unsafe. The area east of Downtown LA, or East LA, also has a higher crime rate than other areas and has gang problems as well. Disneyland - In Anaheim, not too far from the border of Los Angeles County. Palm Springs - Desert playground of the rich and famous. Joshua Tree National Park - Two different deserts meet in this park, which is filled with a vast array of rock formations and desert plant life, especially in the spring or after rainfall when the desert flowers are in bloom. Santa Barbara - A quiet seaside resort town 1.5 h north of Los Angeles. San Diego - A sunny oceanfront city with many attractions such as Sea World, the San Diego Zoo and the museums of Balboa Park. This page was last edited on 24 May 2017, at 08:46.